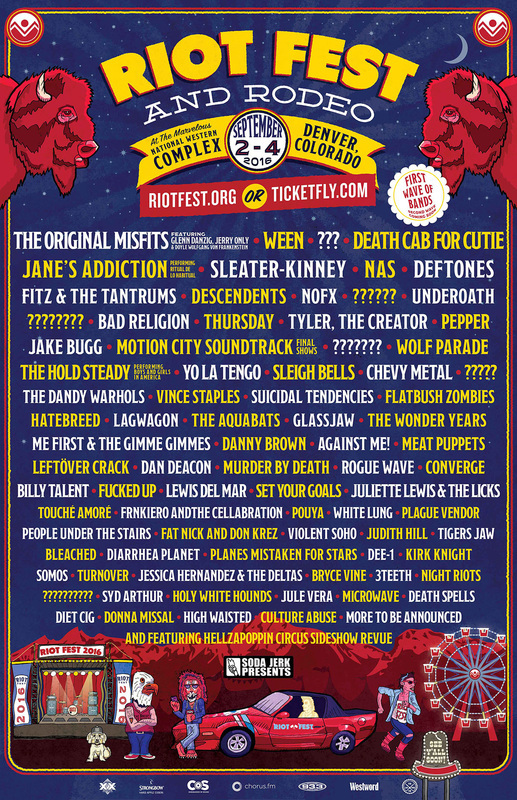 ﻿Published by Sareth Ney on May 19, 2016 at 7:51 a.m.
​Updated on June 29, 2016 at 1:39 a.m.
DENVER – Riot Fest and Rodeo announced the first wave of their lineup, on May 18. National Western Complex will be hosting the event, from Sept. 2 through Sept. 4. The second wave will be announced soon. 3TEETH, Against Me!, Bad Religion, Billy Talent, Bleached, Bryce Vine, Chevy Metal, Converge, Culture Abuse, Dan Deacon, Danny Brown, Death Cab For Cutie, Death Spells, Dee-1, Deftones, Descendents, Diarrhea Planet, Diet Cig, Donna Missal, Fat Nick and Don Krez, Fitz & The Tantrums, Flatbush Zombies, Frnkiero and the Cellabration, Fucked Up, Glassjaw, Hatebreed, Hellzapoppin Circus Sideshow Revue, High Waited, Holy White Hounds, Jake Bugg, Jane’s Addiction, Jessica Hernandez & The Deltas, Judith Hill, Jule Vera, Juliette Lewis & The Licks, Kirk Knight, Lagwagon, Leftöver Crack, Lewis Del Mar, Me First & The Gimme Gimmes, Meat Puppets, Microwave, Motion City Soundtrack, Murder By Death, Nas, Night Riots, NOFX, People Under The Stairs, Pepper, Plague Vendor, Planes Mistaken For Stars, Pouya, Rogue Wave, Set Your Goals, Sleater-Kinney, Sleigh Bells, Somos, Suicidal Tendencies, Syd Arthur, The Aquabats, The Dandy Warhols, The Hold Steady, The Original Misfits, The Wonder Years, Thursday, Tigers Jaw, Touché Amoré, Turnover, Tyler, The Creator, Underoath, Vince Staples, Violent Soho, Ween, White Lung, Wolf Parade and Yo La Tengo were announced as the first wave of Riot Fest and Rodeo. Glenn Danzig, Jerry Only and Doyle Wolfgang von Frankenstein will reunite as The Original Misfits. Jane’s Addiction will perform “Ritual de lo habitual”, from start to finish. Motion City Soundtrack will be performing one of their last concerts. The Hold Steady will play the entire album of “Boys and Girls in America” at Riot Fest and Rodeo. Partners of Riot Fest and Rodeo include Absolute Punk, Alternative Press, Blu Plus+, Bonnie Rose, Channel 93.3 Modern Rock, chorus.fm, Consequence of Sound, Dos Equis, Fireball Red Hot Whisky, For The Love of Punk, Headquarters Cannabis Co., last.fm, propertyofzack.com, rdio, Soda Jerk Presents, Strongbow Hard Apple Ciders, Uber and Westword. The first four tiers of early bird ticket prices for Riot Fest and Rodeo have sold out and two remain. The first of the VIP packages are sold out and one remains. A layaway option is available. To visit Riot Fest’s website, please click here. To like them on Facebook, please click here. To follow them on Instagram, please click here. To subscribe them on Reddit, please click here. To follow them on Twitter, please click here.